I had a bad experience with the September 29 firmware update for the Surface Pro 3 (bot not as bad as some). Unlike many other folks, my own wireless connectivity and speeds have been great with Windows 10, including using the .193 Marvell wireless driver. That was not the case for many, and a fix for some was to find the older .151 driver on the net and roll back to that. Or to use an external 802.11ac USB adapter (as I mentioned in a previous post). The 9/29 firmware was unexpected as there had been one on 9/15. I installed it and rebooted and the wireless was MIA. I rebooted a second time and had connectivity, but it was intermittent, slow, and unreliable. Fortunately, I had the older zip files and drivers and was able to re-install the .193 driver and regain my great connectivity. But this was not the case for others. Reports started appearing on the Surface Answers Forum and customers were reporting loss of wireless, BSOD loops and failed firmware updates in Windows Update history. I sent emails to Microsoft on the issues and was forwarding threads for several days. The update was pulled on Friday I believe. (Edit 10/5/2015: I’m told it was pulled on 10/1, but if the computer has already pulled it down from WU, it can install anytime up to 10 days later). Customers are reporting getting hosed again but the update was probably already on their system awaiting installation.A couple of bad files were posted for SP3/W10 – both a zip and MSI file – neither of which contain wireless or bluetooth drivers for the SP3. This means there are no drivers posted on Microsoft’s site officially for Surface Pro 3 owners running Windows 10. I’ve always thought (and asked) that Microsoft should post all the drivers and leave older drivers available for those that need them. Word came down that doing a system restore should get people up again followed by running the MSI to get the firmware/drivers installed, and the Forum owner posted that after doing a system restore, running the MSI file would take care of the issues. This has not been the case for many. And even getting to System Restore has been a problem for some. “1.Boot Surface using USB recovery media. If you do not have recovery media you can download from here: http://www.microsoft.com/surface/en-us/support/warranty-service-and-recovery/downloadablerecoveryimage. Once you have recovery media proceed to next steps. 2.Press and hold the volume-down button while you press and release the power button. When the Surface logo appears release the volume-down button. 3.When prompted select the language and keyboard layout you want. 4.Select Troubleshoot, then Advanced Options, followed by selecting System Restore then select the target operating system. 5.Use a system restore point prior to applying the System Firmware update. Edit 10/5/2015: Be sure to use a restore point 9/28/2015 or earlier. If you can’t get to restore or don’t have a restore point, it is going to get ugly. I already see this on the Answers Forum. I don’t have a magic bullet and I don’t know if Microsoft is working over the weekend on this. Why Did Microsoft Pull The Surface Pro Firmware Downloads? 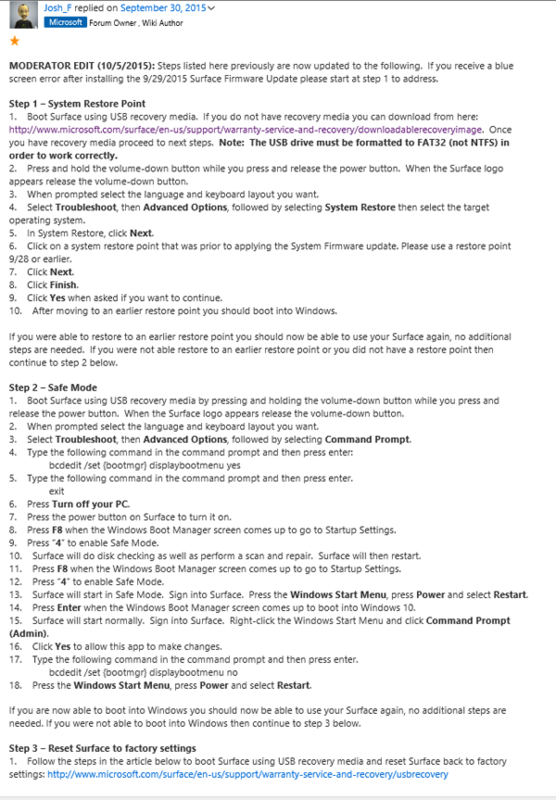 I’ve been sending folks to http://www.microsoft.com/en-us/download/details.aspx?id=38826 to grab all the drivers and firmware for their Surface Pro 3 (but all other Pro SKU’s were there too). Suddenly, folks in the Community Forums http://answers.microsoft.com/en-us/surface/forum/surfpro3-surfupdate/surface-pro-3-drivers-link-website-down/c9338aaf-ecb4-48d4-923b-7e8c0dcc2daa?msgId=21c2cf86-9c67-44e0-b2a0-4b6ef5615c98 are reporting that the link has gone missing – for all countries. But the downloads themselves appear to have been pulled as well. I’ve been seriously afflicted by the Wi-Fi connectivity issues on the Surface Pro 3 and have been considering returning to Best Buy as their short 15 day return window expires Friday. Microsoft states that the firmware updates are being throttled and to keep checking Windows Update. I checked and checked and checked and after 18 hours didn’t have the luxury of waiting for the throttled updates to show up as I wanted time to test these fixes. Microsoft posted the complete SP3 driver/firmware pack overnight so decided to install what I needed manually. For the convenience of others similarly afflicted by the missing throttled update, here are instructions to use at your own risk. I can’t officially support you. Reboot when you are prompted. Keep your fingers crossed throughout. 1. 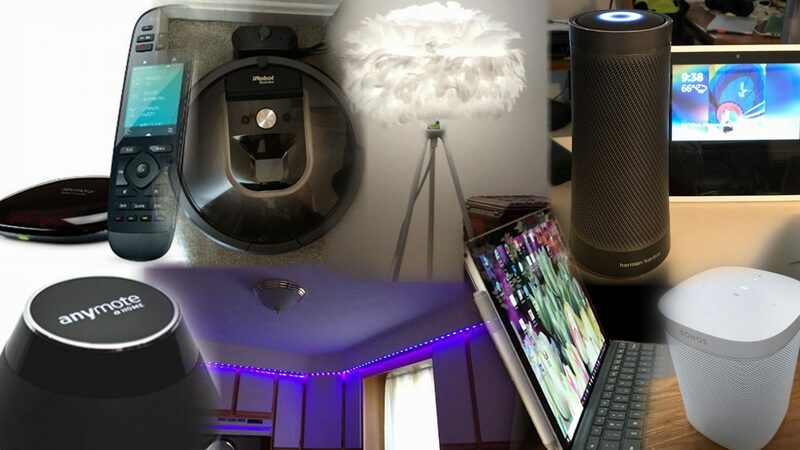 Manually check for updates and install anything offered before beginning. 2. Make sure your Surface Pro 3 is fully charged and plugged in. 3. 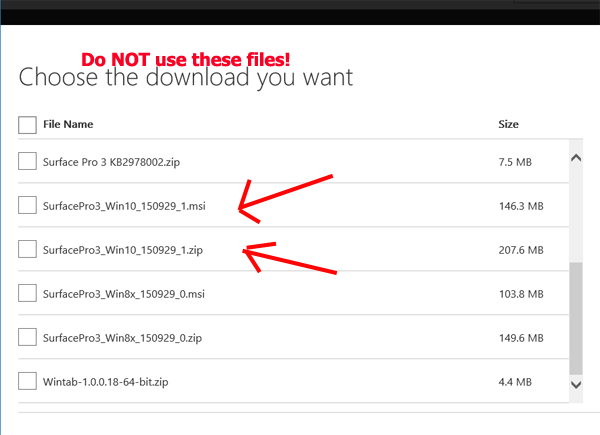 Go to http://www.microsoft.com/en-us/download/details.aspx?id=38826 and download Surface Pro 3 – 16 July 2014.zip (168.0 MB) You will need to scroll the list to find it. 4. Click Next and download to your hard drive. 5. Extract the Surface Pro 3 – 16 July 2014.zip and open it. Note as shown below the files named Marvell and Microsoft. These are the two folders containing the bits you need to manually install the firmware and drivers made available via Windows Update to some users on July 8 and which are slowly being rolled out according to Microsoft. 6. Open The Microsoft Folder. 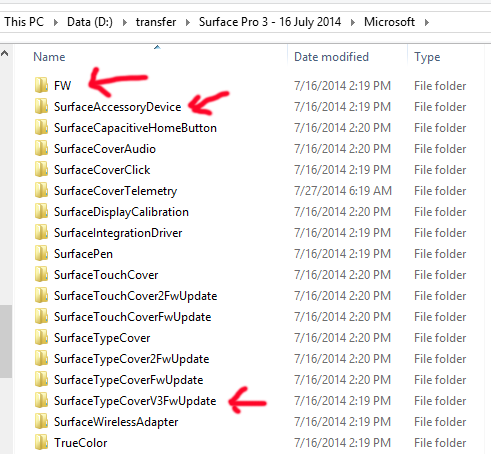 The FW, SurfaceTypeCoverV3FwUpdate (if you bought a new SP3 type cover)and SurfaceAccessoryDevice folder are the ones you will be using. 10. Open the EC folder, right click the inf file and install. Reboot if prompted. 11. Open the SAM folder, right click on the inf file and install. Reboot if prompted. 12. Navigate to the Marvell folder. 15. Reboot (maybe reboot twice for insurance).